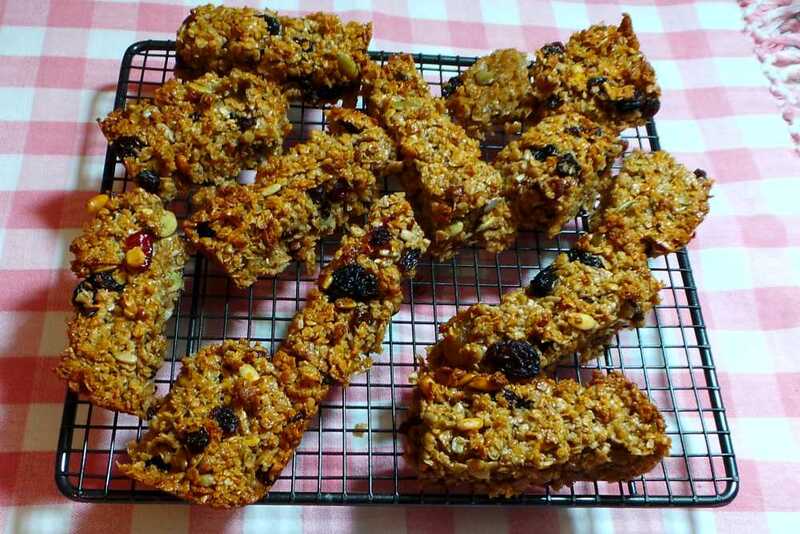 Chewy, sticky flapjacks, just right for a mid morning energy boost. I used a packet mix of different types of raisins and cranberries and a tablespoon of sunflower seeds. Put the butter, sugar and syrup into a medium size saucepan and gently heat until melted. Tip into a lined baking dish 8" x 8" and press the mixture firmly with the back of a spoon. Bake for approx. 20 minutes or until just golden around the edges. Keep a close eye on it and don't let it overcook - it shouldn't be at all dark. Mark the flapjack into about 12 pieces while it's still warm and leave to go cold. Cut the flapjack again when completely cold.